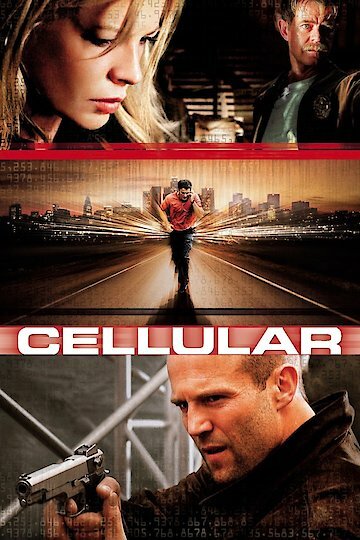 "If the signal dies so does she"
Cellular is an action film that stars Kim Basinger, Chris Evans, Jason Statham and William H. Macy. This film contains some mild violance and language. It runs for approximately ninety minutes and may not be suitable for all viewers. When Jessica Martin returns home from work and finishes talking with her son on the phone, her house is broken into by unknown men. They kill her housekeeper and kidnap her. Locking her in the attic of their safe house, the leader, Ethan, destroys the attic telephone so she cannot call for help. Jessica does not know why she has been kidnapped or what they want from her. Once left alone, Jessica manages to piece together parts of the damaged phone to make a connection. Unable to dial a number, she reaches the cellphone of a guy named Ryan who was just dumped by his girlfriend. Believing the call to be a joke, Ryan begins to hang up, but Jessica manages to convince him that she is telling the truth and that he needs to go to the police. At the police station, Ryan meets Detective Mooney who tells him to talk to the detective on the fourth floor. When Ryan begins to lose signal in the stairwell, he turns around and leaves. When Ethan returns to the attic to question Jessica about something she has no knowledge of, he threatens to get her son if she doesn't tell him what he wants to know. Ryan, still on the phone, hears the exchange and is now trying even harder to help her. Trying not to lose the signal but running out of battery power, Ryan holds up a cellphone store to get a car charger. Officer Mooney eventually checks the case and discovers Ryan was right. The two work together to rescue Jessica and her son from the kidnappers. Cellular is currently available to watch and stream, download, buy on demand at Netflix, Amazon, Vudu, Google Play, iTunes, YouTube VOD online.